A prominent example of the impact of personal initiative comes from a lawyer who joined the national-level Cabinet Office in 2009, Okamoto Tadashi. Okamoto was one of a number of lawyers who were recruited to assist in administrative reform and deregulation efforts after the Democratic Party of Japan became the ruling party. His activities took a sharp turn after the March 2011 disaster. He received permission from the Cabinet Office to head up the Emergency Headquarters of JFBA, in addition to his regular responsibilities; and he took the lead in assembling a database of the contents of free consultations being provided by lawyers for victims of the disaster. In turn, analysis of that data provided valuable information for formulating new laws and regulations, together with revised interpretations of existing laws and regulations. In October 2011, Okamoto left the Cabinet Office. Two months later, he assumed another government-related position, heading up research staff for the Nuclear Dispute ADR Centre. Through his experiences, he became convinced of the importance of having lawyers serve in a broad range of government bodies. Shortly after he became head of the JFBA Emergency Headquarters, he observed that local governments throughout the disaster region were ill-prepared to meet the legal needs they faced and pushed JFBA to exert efforts to persuade the local governments to hire lawyers on a fixed-term basis. To his regret, he reports, the JFBA leadership at the time did not appreciate the importance of the issue. He himself remained so sure of the need for lawyers at the local government level, especially in the disaster area, that he reached out to influential lawyers and academics, and with their support he visited the offices of vice governors, vice mayors, and personnel offices in the region. In January 2013, evidently persuaded by those efforts, Iwate and Miyagi Prefectures hired the first kōmuin bengoshi in the disaster region. 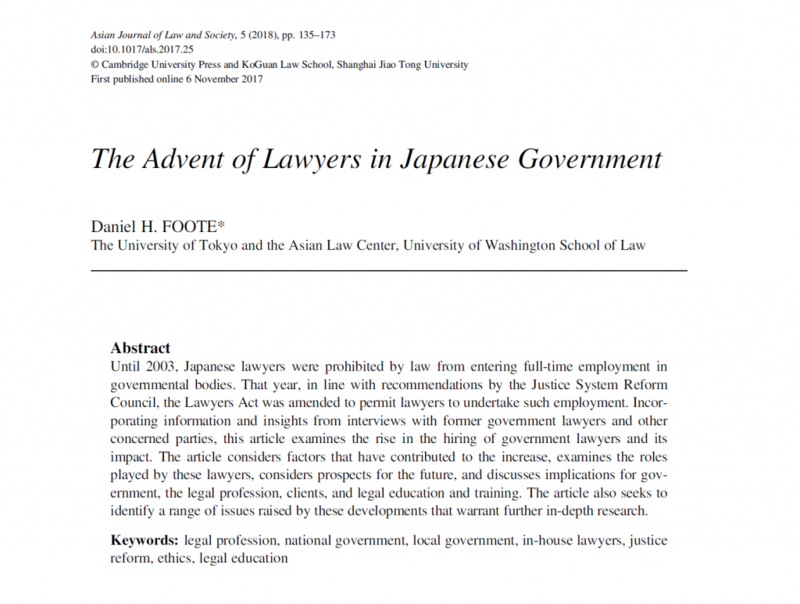 At that point, Okamoto observes, JFBA at last threw its weight behind the calls for local governments in the region to hire lawyers. Okamoto has continued to be a strong advocate for the hiring of kōmuin bengoshi, at both the national and local government levels. He has been an active member of JILA’s section for government lawyers. 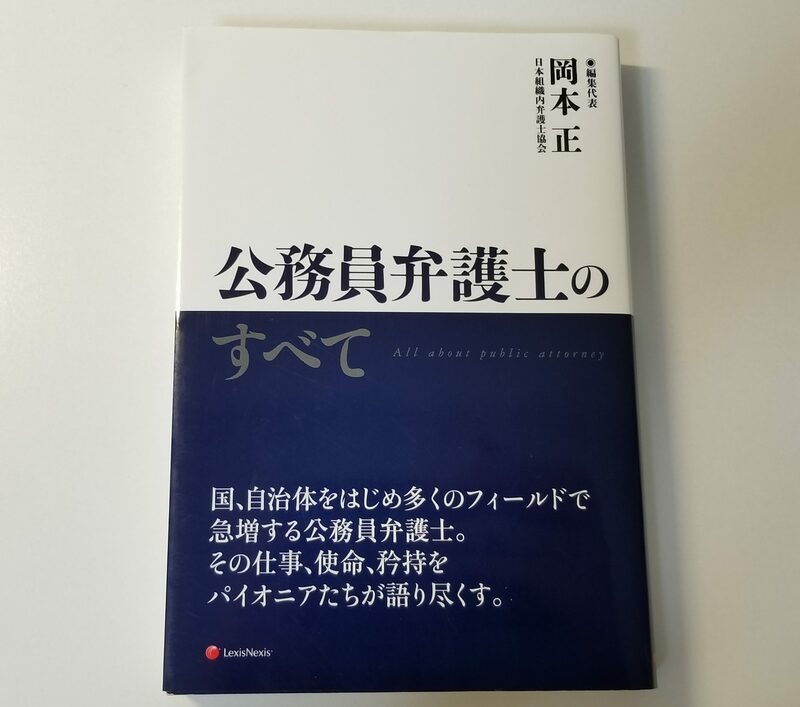 Most notably, he organized and served as the supervising editor for a book published in the spring of 2016, Kōmuin Bengoshi no Subete (All About Kōmuin Bengoshi), which contains essays from a total of 26 lawyers, 16 of whom have served in governmental bodies at the national level, eight at the local government level (including four from the disaster region), and two in non-governmental organizations (NGOs) (hospital and university). That book seems certain to serve as a valuable promotional tool on both the government-hiring side and the lawyer-recruiting side.